I’ll begin with a tangent, just to get it out-of-the-way, and hopefully stay focused later. Although my first name is Eagle, I wasn’t born on the Mayan day Men (Tzikin). My sun-sign is Lamat, and I realized pretty early that Lamats and Mens get along well. More on that some other time. The sun-sign Men embodies physical abundance achieved effortlessly by acute vision, cooperation, good teammates, and a profound passion just for being alive and awake. On Men days the Maya give thanks to money and success in the most positive and guilt-free way possible. For my own part, growing up in a western country, money has mostly been a negative element, almost always attached to some sort of guilt. In our childhood home, the ‘M’ word came to signify prosperity, education, culture, and a curious sense of self-betterment. Not to value money correctly, to waste it carelessly, not to appreciate the sacrifices it entails, or to aspire to live on social security and welfare – all came to mean “wrong, try again” for us. As children to immigrants, we were expected to go to school every day and later get a good job to go to every day; a permanent job to last a healthy, 4-decade career. Our parents and family all wanted a better tomorrow for us, and the job recipe was the bona-fide, over-the-counter formulae to achieve it. Needless to write (but I’ll go ahead anyway) today work doesn’t quite mean what it used to back in the 80’s. It really is awesome to stop and consider how much of the career world has been automated and outsourced out of existence in the last 30 years or so. It is a profound, forced (and probably organic) reform that has manifested much faster than any of the existing, traditional organizations have been able to react or adapt to. It begs many questions regarding how prosperity should be fairly distributed between an ever-growing mass of unemployed people, made redundant by the very science and technology they themselves have realized as ‘human resource’. Over the years, I was quite sorry to realize what hasn’t yet changed nearly as much. As a teenager, for me to follow my father’s advice and get an engineering degree at the age of 25 meant my life as I know and love it is about to end. I saw his immigrant, foreign common sense in direct contrast to what I picked up as a native in a familiar land. I despised money as much as my parents revered it. So I had to come to terms with their sacrifices, and with the degree to which I chose not to follow their advice and offered opportunities. I guess the Mesoamericans are not quite like that when it comes to guilt and gilt. Here is Winston Churchill (6-Men) giving one of his famous speeches on November 20th 1942 (2-Imix), following the Allied victory in Egypt. A spark must be well placed so as to bring forth a living fire. As a delicate, young flame it first feeds on the fuel most dry and combustible. After developing further and building up heat, the fire can now diversify its appetite to anything close enough to it. If not contained and controlled, this is where fire becomes very dangerous. When violence hits the streets, it is a manifestation of strategically-placed sparks, shielded enough from the winds as to start the chaos that is uncontrollable fire. This is the situation most favorable for centers of power and control. Order, whether new or old, must come out of chaos. Chaos comes out of constant polarization, bigotry and division between and within people. But even if sparks are placed in the best strategic locations, the dross must still be sufficiently dry and innate in order to bring forth the fire out of the spark. In human affairs, dry dross means individuals and mobs ready to commit acts of violence and deception against some unlucky scapegoat. It also means that survival and personal gain take precedence to more worthy human concern and endeavors. It means that an ongoing process of social bankruptcy is climaxing. An out-of-control fire being born of a violent spark used to be something to worry about. But with the mass awakening taking place lately, the dross is probably very wet now. A small fire might spring up here and there, but it’s not going anywhere. It runs into moral-based communities and heart-centered people. It runs out of fuel and is snuffed out coming up against well informed individuals and carefully organized task-groups. I walk in the woods, up a hill, picking up dry sticks to start a camp fire. I circle the site where I left my bags until my hands are full of wood. I return to a circle of small stones and drop my load inside it. The wood is divided into starters and main fuel. I take the starters and arrange them like my father once showed me. I make a small fire and guard it from the weather. The fire remains alive because the sticks are bone-dry. To care for and contain the living fire I add fuel when needed, clean around it, and split the longer branches. In turn, the fire takes care of me by just being there to keep me warm and hypnotize me to sleep. It’s a mutual care-taking bond that shapes communities and civilizations alike. “This is the moment I dreaded. I wish I could do this forever.” – Andy Rooney (1-Oc) on Oct. 2, 2011 (13-Ix). He died early the next month. Once there was a bloodhound who decided to have a second career. After doing routines and watching over his own territory he decided to dedicate his keen senses and mind to the service of the common good. At first he thought about a solid move to Law and maybe Justice a bit later. He remembered his days as a lonely hobo, spending cold nights with the underprivileged. He could help them out of trouble and give young cubs a fighting chance. There’s bravery in that. But then he thought about corruption, and how it can undermine and get to even the bravest alpha males. Maybe corruption is especially appealing to that kind of dog. After all, they are the ones who tend to settle down for comfort way too early, and then come the treats and candy. Before they know it the new cubs outrun them. Bottom line – He never got along with law dogs, and he’s sure as bark he doesn’t want to become that kind of dawg. So he became a spy. It didn’t happen overnight. At first it was just a pure decision, with no apparent change on the surface. After all, getting out of old habits never comes easy to any dog. There’s breakfast, walk, brunch, sunbathing, workout, and all the rest of it. It was rather a gradual transition, involving much soul searching and adaptation of existing skills to new applications. “So what do I have to work with?” thought the bloodhound. Loyalty, a territorial fixation, fighting and team spirits, great bravery, a solid aura of security, a natural affinity to the good life with family and friends… you get the picture. On the second day of the spy retraining crash course Bloodhound is confronted by a key question. It is key because its answer would determine what kind of spy he’s going to become. The question put to him by 2-Chuen is: Can you fake it till you make it? Can you convince strangers that you are someone else? If you can’t then you probably won’t be doing any covert ops overseas. You can still help the intelligence community, but at an administrative, logistic or analytic capacity near home. But if you can, if you know the Monkey’s (Chuen) Business, the way of actors, performers, teachers, and brilliant salespersons – you’ll probably get a different kind of action behind the lines and beyond the horizon. There’s no merit nor drawback to any of these options. The only way to know the answer is to know yourself. If you try going for some glory that has little to do with your gifts it might lead to disappointment and deflation. Then you end up doing what you should have picked today, anyway. So the best way for Bloodhound to continue perusing his new career past day two is to follow his gut and nose. Not think too long and come up with some wiseass answer, shrouded in fantasies and tricks of the mind. He opts to be sincere and faithful to himself, to go with the first thing that naturally comes up. He picks up a scent on the ground, looks around and sniffs the air. Bloodhound ran and hiked up many roads. He got to know the main roads and their dangers, and then he recognized the side and hidden roads. During the third day Bloodhound did them all. 3-Eb is when he takes his orientation lessons and training. There are roads that are common to all spies, regardless of where their loyalties lie. There are ways that only a handful of canines know about. Then he learns about the situations when even the darkest road must be considered just to survive. There is no way of knowing how good an unknown road is until I use it and see where it leads. As long as I have faith in my destinations, which road I take is a matter of choice. Leadership is a peculiar quality which allows me to walk an unknown road as if I know exactly where I’m going and how I’m going to get there. When alone I lead myself. When my pack is following me they tune to one frequency. Then communication becomes crucial. Without leadership potential remains dormant and unseen beyond a bend in the road. On the fourth day Bloodhound met his mentor Ben. It was clear right from the get-go that he could not cross any lines with this particular teacher. He submitted to Ben’s directions and restrictions, realizing he can’t go on trying a new way on a daily basis. He also had enough of going solo and was now looking for new and exciting best friends. Team spirit was never an issue for Bloodhound. He knew that the best times he had were when he was part of a team, sometimes leading and then following. There was nothing they couldn’t do together. Walking alongside him, the mentor talked about Bloodhound’s future, his destiny. The industry which employs spies is known as Intelligence. What it does is first collect information and then try to make sense of it. Bits of data are connected to create a new and more complete understanding, which in turn allows for better decision making and action taking. At his/her best, a spy always knows something that you do not. This is the edge which makes them spies and the rest, well, just citizens. It’s a kind of ancient magic which is known only to the most skilled and cunning. Day five began with evasion and concealment drills, taught by an astute cat (Ix the Jaguar). Bloodhound realized the hard way that any dog can learn plenty from a cat. Alan Watts (1-Imix) once said he had met many Zen masters during his life, “all of them cats.” The indirect approach, the sudden leap into a fury of action, the stealthy moves that escape detection – all these were new to Bloodhound. Just last week he was still deep in his comfort zone, with no secrets and no scars. Now nothing came easy. Although he never climbed any trees, Bloodhound learned a lot from the cat. On day six he began to see the big picture, having realized a new and elevated perspective. It was a new equilibrium between effort and observation, focus and periphery. He regained his love for duels and sports. Being a spy is a constant match between opposing teams, a battle of wits and nerves. The sun-sign Men (eagle) is known for its affinity to challenges and high-stake winning. It is physical abundance achieved effortlessly by good vision. On Men days the Maya give thanks to money and success in the most positive and guilt-free way possible. Bloodhound strived to live the high-life of a spy because it’s a generously rewarded job. The risks are high, but the pay is higher. Only true, all-heart players like him could pull it off. B turned out to have a special talent to slip through borders as if they weren’t there. Without really trying he seldom drew any attention to his presence, unless he chose to do so. Wherever he traveled on his new job, he looked and acted just like the local folk. He became sensitive to the canine nature that is common to all breeds. The earth (one of Caban’s meanings) breeds people and dogs of all kinds. It has a frequency and resonance that borders cannot contain. When tuned into it, whales are able to navigate great distances from spawning seas to hunting seas. Herons can do the same over the oceans, and so can elephants on land. It is the resonance which allows for synchronicity and coincidences around your neighborhood and on the other side of the earth. When strangers reverse ill fortune and help comes from nowhere, when least expected. 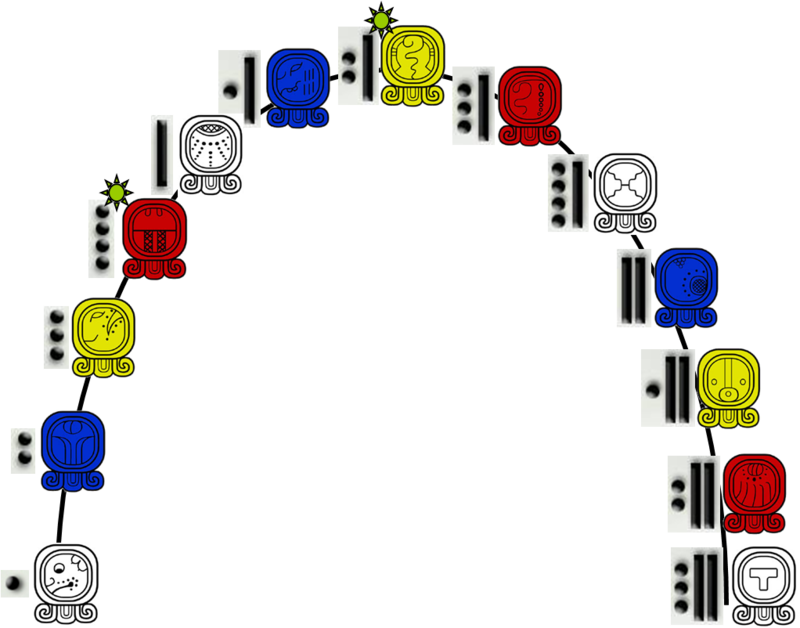 The first stage of each trecena is equivalent in the stage sequence to Imix (The Crocodile) in the uinal sequence, since it comes first. This assumption is quickly put in parentheses and must be taken in context, since the Tzolkin is cyclical, and has no beginning nor end. This point has been repeatedly stressed by Ken Johnson over the last years, and I agree with it. It is therefore only for instructional and research purposes (especially for Western scholars) that Imox/Imix is considered to be the first sun-sign, and this is then coupled with the first number. Why Western scholars? Well I put it to you Europeans, North Americans, etc. Which is the first number in your mind? One, right? The Maya would say zero. In the Ha’ab it’s known as the month’s seating. Other cultures would maybe say that two is the first number because it is the first plural. You only need a concept of numbers if you have more than one. It’s either one (as in experiencing 1-ness) or many. However, I’ve decided consciously and after due consideration to continue and regard 1-Imox/Imix as the first day of the cycle. First of all, any point on a cycle is already both the first, and the one immediately after the last step of any circular journey. This is why taking my own kin of birth (8-Qanil/Lamat) into calculation is key to pondering my own personal voyage. However, the cycle also needs a common starting point by which a community – be it Western or other followers/scholars – can relate to and share insights about their journey between them. Since this point can be arbitrary, I pick 1-Imox (Imix hereafter). 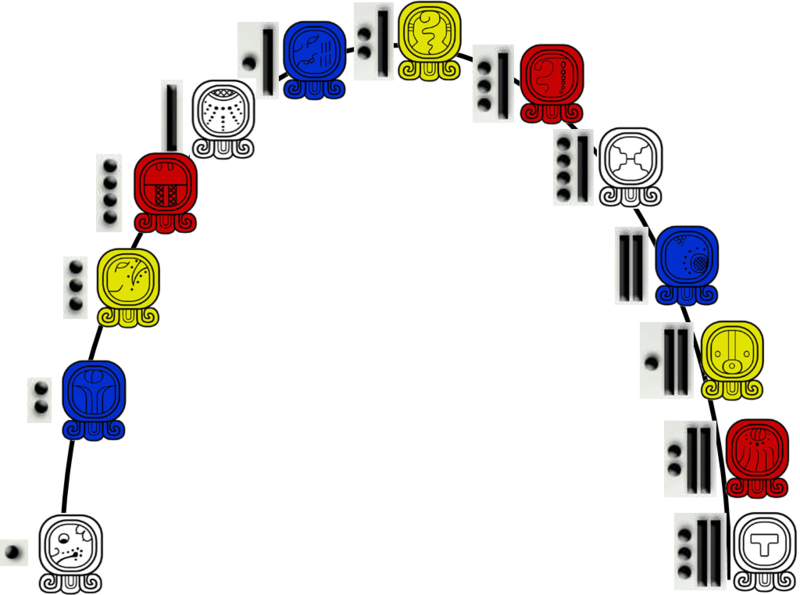 Stage 1 can be called “All-in-One”, since it is the most rough and basic form of a particular sun-sign (Oc in this case). Ian Xel Lungold called stage 1 Unity for good reason. It is the unity of mind and purpose that is embodied in the first stage, split asunder in the second stage (much like a living cell), and continues to develop and manifest throughout the trecena. Many of the Stage 1 people I know personally have the same naïve sense that everyone can work out things together if they really tried. It is a young mindset, typical to the Source of all things. So, 1-Oc is the condensed, most subtle and primary version of all the things I listed above in the preface, along with other symbols and understandings of the sun-sign known as Dog. It is the brainstorming session of sowing Seeds of Love and Loyalty, which begin to grow tomorrow and continue to evolve over the next 12 days. If stage 1 is the Father, stage 7 is the Son. Every father is also a son and every son grows up to be a father. These are the 2 main axis points of the Current process of evolution. What I like about stage 7 is that its sun-sign is always on-deck to begin a new trecena after the next one is over. This mathematical fact correlates well with the old mountain-climbing analogy. When you reach stage 7 you’re at the very top of the mountain. You can clearly see the next trecana (at least), but also – the one right after that. However, you are also extremely stationary, and at the same time you’re edging to start climbing down.